Retail Orders under £180 (inc VAT) are charged at £25.00 (Standard Delivery - UK Mainland excluding some highlands) including full tile sample requests. Retail orders over £180 (inc VAT) qualify for free standard delivery (three working days minimum - UK Mainland excluding some highlands). Please enter any delivery instructions in the notes box on the delivery page before proceeding through the payment page. 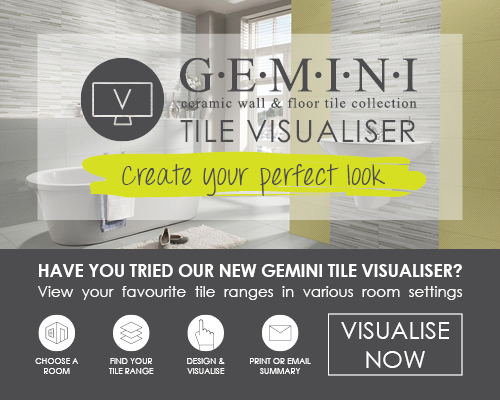 Orders for current Gemini Tiles (excluding clearance items) can be collected free of charge from one of our many stores otherwise our standard delivery charge applies. We aim to process and dispatch your order within 72 Hours of receiving it (subject to stock), please allow seven working days for your order to arrive. Someone must be in attendance as all orders need to be signed for. Upon delivery please ensure that all goods are carefully checked before signing, as you are signing to say that you are accepting the items in good condition. We go to great lengths in order to make sure your delivery arrives both safely and efficiently however breakages do occur, if in the unfortunate event a delivery issue occurs please use this form to report it within 48hrs of receiving the goods so we can assist you using our Delivery Discrepancies Form. For health and safety reasons we cannot transport goods into a property (delivery to Kerbside only). See our terms and conditions below for full details. We use a variety of delivery methods ranging from 1.5 tonne (larger than a transit van) to 18 tonnes (equivalent to a bin lorry) and to ensure a smooth delivery we need to check that your delivery address is accessible. Upon placing your order we will ask you to tell us about any access problems such as height, width or weight restrictions and any parking restrictions as well as access restrictions such as gated communities. You also have the option to collect from your local CTD Tiles store (UK Mainland). We have made it easy for you to collect from your local store, and it’s free. When you are at the delivery stage simply enter your postcode and select your nearest branch. When your order is ready for collection you will be notified. Please note this excludes clearance items. We aim to have your order available for collection within 3 working days (72 hours) of receiving it (subject to stock). We will notify you once your order is ready for collection by either telephone or email. The earliest time you are able to collect is after the 72 hour period. Please bring with you a copy of the order confirmation email as proof of purchase along with the payment card you used. If you've paid by PayPal, then please bring a photo ID, which must be your passport or driving licence. As a reminder, our stores have different opening times. Please check the opening times of your local store before coming to collect your order. Please note we reserve the right to change our delivery costs in accordance with the market value. Please refer to your 'My Account' section for details. Returns may be made to your local CTD Tiles store (excluding World's End Tiles & Bassetts) or by contacting us to arrange a return (excludes clearance items) - returns can only be made with prior arrangement. You will incur a 20% restocking charge of your returned goods. You will be exempt from this charge If you are returning your full order within 14 days of receiving your order (this applies to online orders only). Please click here to fill out our returns form. Please note the cost of the return will be at your expense. You can only return tiles in full un-opened cartons for credit. Please see below in our terms and conditions for full details. These terms only apply if you are a consumer. A consumer means any natural person acting for the purposes outside his trade business or profession. If you are acting in the course of your trade business or profession click here business to business terms of sale. These Terms will apply to any contract between us for the sale of Goods to you. Please read these Terms carefully and make sure that you understand them, before ordering any Goods from our site. By clicking on the "I Accept" button and placing an order, you have accepted these Terms. If you refuse to accept these Terms, you will not be able to order any Goods from our site. We amend these Terms from time to time as set out in clause 2.6. Every time you wish to order Goods, please check these Terms to ensure you understand the terms which will apply at that time. This clause sets out how the goods we supply to you will be described and priced and our obligations to you to ensure that descriptions and prices are accurate. The clause explains our obligations to supply goods to you and your rights if we are unable to do so or if variations arise in the finish of products supplied. This clause explains when and how you can pay for goods which you order from us and the steps we may take if you are late paying. This clause set out the procedure and cost in the event that we agree to deliver goods to you. It also sets out our liability to you where you ask us to enter private property and the circumstances in which we may refuse to do so. This clause explains when you may cancel an order which you have placed with us and when you may return goods that are not defective which we have supplied to you. It also explains your rights where you have purchased goods “at a distance” (by our Website or over the phone). This clause sets out three ways in which you will be deemed to have accepted goods supplied by us to you. This clause set out what you should do in the event that you are not satisfied with goods which we supply to you or if we deliver a smaller quantity of the goods than was agreed between you and us. This clause sets out our liability to you in the event that we supply you with goods which are defective and the circumstances when we will not be liable. This clause explains the limitations and exclusions that we place on our liability to you in the event that we breach the terms of the contract. This clause explains when you will become responsible for the goods and when ownership will pass. It explains that ownership will not pass until you have paid for the goods and any other sums owing to us in full. This clause explains the consequences of you failing to pay us for goods on time and the steps we may take if you are declared bankrupt or become insolvent. This clause explains the extent of our liability in the event that we are unable to complete the contract between us due to circumstances which are beyond our reasonable control. ‘We’, ‘we’, ‘Our’, ‘our’, ‘us’	means Saint-Gobain Building Distribution Limited trading as CTD (Company Number: 1647362) whose registered office is at Saint-Gobain House, Binley Business Park, Coventry, CV3 2TT. 2.1. These Terms apply to all Goods supplied by us via our Website. Orders are only accepted under these Terms and they may not be altered or added to without our written agreement. 2.2. In relation to the Contract we intend to rely upon these Terms and any documents referred to in them along with any written acceptance of an order placed by you as to the terms of the agreement between us. 2.3	Whilst we will accept responsibility for statements and representations made by our duly authorised agents, if you require any changes to these terms these must be set out in writing and signed by one of our directors. Please see the how to shop section for information on how to place an order. You will have an opportunity to check and correct any input errors in your order up until the point at which you submit your order by clicking the “confirm order” button on the check out page. After you place an order, you will receive an email from us acknowledging that we have received an order. However, please note that this does not mean that your order has been accepted. An agreement between you and us for the sale of any Goods only exists after we have accepted your order and have confirmed it in writing by email to an email address you have given ("Acceptance Email"). Once we do so, there is a binding legal contract between us (the 'Contract' as defined above). 2.4	Any Quotations we provide do not constitute an offer to enter into a contract with you. In order to purchase any Goods from us you will need to go through the process set out in paragraph 2.4 above or contact one of our stores for further information. 2.5	We may change these Terms without notice to you in relation to future sales. Therefore, please check and ensure that you understand the Terms which will apply at the time you purchase any Goods. 2.6	In providing any advice to you with regard to the suitability of any Goods or materials for your specifications we shall rely upon the information that you provide to us. You must ensure the accuracy of any information you provide to us including any applicable design, drawing or specification and you must give us any necessary information relating to the Goods within sufficient time to enable us to perform the Contract in accordance with these Terms. 2.7	The Website is only intended for use by people resident on mainland Great Britain. We do not accept orders from individuals outside mainland Great Britain. 2.8.3	You are resident on mainland Great Britain and you are accessing the Website from there. 2.9	Certain Goods on our Website can only be purchased if you satisfy the legal age requirement for that product. We are not allowed by law to supply these products to you if you do not satisfy these age requirements. If you are underage, please do not attempt to order these Goods through our site. Goods with an age restriction are clearly identified on the Website before you order. 2.10	We may provide links on the Website to the websites of other companies, whether affiliated with us or not. We cannot give any warranty or undertaking in relation to any products that you purchase from companies to whose website we have provided a link on the Website and any such warranties and undertakings are DISCLAIMED by us absolutely. This DISCLAIMER does not affect your statutory rights against the third party seller. 3.1. The description and price of the Goods you order will be as shown on the Website at the time you place your order. We reserve the right to vary the price of the Goods at any time before the Contract becomes binding on us. Whilst we try to ensure that all descriptions and prices are accurate and are kept up to date, errors may occur. If we discover an error in the price or description of the Goods you have ordered, we will let you know as soon as reasonably possible. We will then offer you the option of reconfirming your order or cancelling it in exchange for a full refund. 3.2. Our ability to supply the Goods is subject to us holding them in stock or being able to obtain them. If on receipt of your order, the Goods you have ordered are not available either in stock or by special order we will inform you as soon as reasonably possible and if we are unable to obtain them in an agreed time we will refund or credit you for any sum that has been paid by you or debited from your debit or credit card for the Goods. Please note special order products can take up to 2-3 weeks to arrive from the manufacturer. Some special order tiles may only be sold by the box this will be shown on the product page. Certain special order items may only be returnable to a specific location or store this will be clearly specified on the product page. 3.3. In the event that we are unable to supply the Goods to you for a reason beyond our reasonable control, we will notify you and may offer you alternative similar products (if available). You shall be entitled to accept the alternative goods offered with a refund of any difference in the price if the substitute is cheaper or by paying extra (as notified to you in advance) if the substitute is more expensive or you shall be entitled to cancel your order and obtain a full refund of any amounts paid for the Goods which we cannot supply. 3.4. Whilst we try to maintain continuity of supply in relation to our product lines, we reserve the right to discontinue any product at any time and we shall be under no obligation to supply you with a discontinued product in the future. If you have already placed your order, we will notify you as soon as reasonably possible that the Goods are not available and offer you an alternative product if one is available or a full refund. 3.5. In the case of certain products, variations may arise in the finish of those products, for example where they originate from different factory batches. We shall not be liable for any loss caused by such variation where such variation does not diminish the quality of the Goods. 3.6. We take every precaution in the preparation of our catalogues, technical circulars, price lists, other literature and the information on the Website, but these documents and information are for your general guidance only and do not form part of the Contract (in the absence of fraud on our part). If you require advice in relation to the Goods, a specific request for advice should be made. 3.7.3.	any delay caused by any failure by you to give us adequate information or instructions, but if you do not wish to pay the higher price, you may cancel your order and claim a full refund. 3.8. Where you require delivery to be made, we may require you to pay a charge for the delivery of the Goods in addition to the price and, if applicable, this charge will be quoted to you at the time you place your order for the Goods. 3.9. The price of the Goods and delivery charges are inclusive of VAT unless VAT is shown as a separate element. The option to switch between prices showing including and excluding VAT are presented on each product page. 3.10. Prices and delivery charges displayed or otherwise communicated are valid and effective only in mainland Great Britain. 4.1. You can pay for the Goods and delivery charges by any method shown on the Website or which are notified to you at the time you place your order. 4.2. You must pay for the Goods at the time you place your order unless you hold an account with us or other credit terms which have been previously agreed in writing. If you fail to pay for the Goods on the date on which payment is due, we reserve the right to charge you interest on the amount unpaid at the rate of four per cent per annum above Barclays Bank Plc’s prevailing base lending rate from time to time, until payment is made. Payment by credit or debit card will not be effective until we are in receipt of cleared funds. 4.3. If you have an account with us then payment is due on the last day of the month following the month in which the Goods are delivered unless other credit terms have been agreed between the parties. If you choose to pay for the Goods on collection, you will not be able to collect the Goods prior to us receiving payment of all sums due in cleared funds. 4.4. If for any reason you owe us any money we may deduct these sums in calculating any amount which we may owe you. 5.1. Before we agree to deliver the Goods to you, you must provide us with an address for delivery along with all of the information which we will reasonably require to enable us to determine whether we will be able to deliver the Goods, the appropriate method of delivery and the cost to you of providing the delivery service. 5.2. Your order will be fulfilled by the delivery date set out in our acceptance of your order or, if no delivery date is specified, then within 30 days of the date of our acceptance of your order, unless there are exceptional circumstances. 5.3. If we are unable to make an agreed delivery to your address for reasons due to our own fault, we will inform you as soon as possible and arrange another date for delivery or, if we are unable to deliver to the address at all refund or re-credit you for any sum that has been paid by you or debited from your debit or credit card for delivery. 5.4. If there is no one at the address you have given who is competent (and over the age of 18 years) to accept delivery of the Goods by signing for them or you wish to delay a previously agreed delivery date, we will seek to agree an alternative delivery date with you or agree for you to collect the Goods. We reserve the right to make an additional charge for re-delivery and further storage of the Goods and you will be informed of the amount at the time we arrange an alternative date. 5.5. If Goods are to be deposited other than on your private premises we will deliver the Goods as near as possible to the delivery address as is safe and the public highway permits. You will be responsible for complying with all regulations, permits and charges and for all steps which need to be taken for the protection at all times of persons or property. You will reimburse us in respect of all reasonable losses, damages, costs and expenses we may incur as a result of such delivery whether on the public highway or elsewhere. Subject to clause 10, we will remain liable for all losses caused by our own negligence. 5.6. We will only enter private property if we are given specific authority. Once invited onto private property we accept no liability for damage caused to that property by our delivery drivers (whether directly employed by us or by a third party) unless caused by our own negligence. We reserve the right to refuse to deliver the Goods to premises that are considered by our delivery drivers to be unsuitable or unsafe. We will notify you as soon as reasonably possible of the reason for non-delivery. 5.7. You agree to reimburse us in respect of all losses, damages, costs and expenses that we incur in complying with any specific delivery instructions which you may give us and which relate to clauses 5.5 and 5.6 above. Any amount which you reimburse to us will be reduced in proportion to the extent that such losses, damages, costs and expenses are due to our negligence. 5.8. Unless we state otherwise, all our quotations and estimates assume delivery of the full contracted amount of Goods. We reserve the right to levy additional charges for delivery by instalments where requested by you. 5.9. If you keep our delivery vehicle waiting for an unreasonable time or the delivery driver is obliged to return without completing delivery, or if due to the nature of the Goods we have to provide additional staff to unload Goods, a reasonable additional charge will be made that reflects the extra services provided. 6.1. If you are a consumer, you have a legal right to cancel a Contract formed over the internet, telephone or by mail order under the Consumer Protection (Distance Selling) Regulations 2000) during the period set out below in clause 6.2. This means that during the relevant period if you change your mind or for any other reason you decide you do not want to keep the Goods, you can notify us of your decision to cancel the Contract and receive a refund. Advice about your legal right to cancel the Contract is available from your local Citizens' Advice Bureau or Trading Standards office. This clause does not affect your right to return faulty or mis-described Goods. 6.2. If you have ordered Goods on our Website or over the phone your right to cancel the Contract starts from the date of the Acceptance Email, which is the date the Contract between us is formed. Your right to cancel the Contract ends after the expiry of seven working days starting the day after you receive the Goods. A working day is any day other than the weekends and bank or other public holidays. 6.4. If you exercise your right of cancellation after the Goods have been delivered to you, you will be responsible for returning the Goods to us at your own cost. Goods not used and still held by Us as current stock can be returned to Us for a full refund within 28 days of purchase, provided the Goods are in original packaging, unused, and undamaged and with a copy of the invoice. A restocking charge of 20% of returned goods will be levied for the return of such goods. You will be exempt from this charge If you are returning your full order within 14 days of receiving your order (this applies to online orders only). Only full boxes will be accepted unless you are returning your complete order. The Goods (excluding clearance items) can also be returned to one of our branches. A full list of our branches can be found on the Website and you must make prior arrangement to return the goods with the website team - you can do so by clicking here. You must take reasonable care to ensure the Goods are not damaged in the meantime or in transit. If the Goods are damaged (or have been modified) by you or are damaged in transit in a way that you could have foreseen (such as not being sent back in the same or similar packaging as sent to you), we will assess what damage has been caused and, at our discretion, those Goods may be rejected and a proportionate part of the refund withheld. Certain special order items may only be returnable to a specific location or store this will be clearly specified on the product page. 6.5. Once you have notified us that you are cancelling the Contract, we will refund or credit you within 30 days for any sum that has been paid by you or debited from your credit or debit card for the Goods. 6.6. If you do not return the Goods as required under Clause 6.4, we may charge you a sum not exceeding our direct costs of recovering the Goods and/or replacing any Goods that are damaged. 6.7. You do not have the right to cancel the Contract if your order is for Goods that are made to your specifications or clearly personalised or which by reason of their nature cannot be returned or are liable to deteriorate or expire rapidly. 7.1.3.	by using the Goods or keeping the Goods longer than a reasonable time without telling us that you have rejected them. 8.1. If the Goods do not conform to your order, if they are damaged or faulty, if they are not of satisfactory quality or are otherwise defective you should reject them on delivery, or, if a defect is found after acceptance we will (subject to confirmation of the defect) exchange the Goods or refund you in full in accordance with clause 9 below. 8.2. Should a short delivery (of less than the full quantity of Goods ordered) have been made, you must notify us within a reasonable time of discovery of the short delivery and we will make good the shortage. Please click here to notify us. 8.3. Where it would have been apparent on a reasonable inspection that the Goods do not conform to the Contract and you fail to give us notice of this within a reasonable time you will be deemed to have accepted the Goods and have waived any right to reject the Goods. 9.1. If the Goods have a Defect at the time of sale and you have not yet accepted the Goods, we will repair or replace the Goods or, if this is not possible or you decide to reject the Goods, we will refund you in full for the defective Goods. Where you have accepted the Goods, the provisions of clause 9.2 shall apply. 9.2. Where you have accepted the Goods and within six months of delivery there is a Defect, we will repair or replace the Goods or, if this is not possible or you decide to reject the Goods, we will refund you in full. However, we will not be obliged to do so if we can prove that the Goods did not have a Defect at the time they were delivered. 9.3. Nothing in these Terms will affect the terms of manufacturers’ warranties and guarantees or your legal rights in relation to Goods that are faulty or not as described. Advice about your legal rights is available from your local Citizens Advice Bureau or Trading Standards office. 9.4.7.	if the Defect is a result of fair wear and tear. 10.1. If we fail to comply with the terms of the Contract, we are responsible for loss or damage you suffer that is a foreseeable result of our breach of the Contract or our negligence, but we are not responsible for any loss or damage that is not foreseeable. Loss or damage is foreseeable if they were an obvious consequence of our breach or if they were contemplated by you and us at the time we entered into the Contract. 10.2. We only supply the Goods for domestic and private use. You agree not to use the product for any commercial, business or re-sale purposes, and we have no liability to you for any loss of profit, loss of data, loss of business, business interruption, or loss of business opportunity. 10.3.5.	defective products under the Consumer Protection Act 1987. 10.4. We will not be liable for any death, or personal injury to you or anyone under your control that was not caused by our negligence. 11.1. Risk passes to you as soon as we have delivered the Goods and you will then be responsible for them. 11.2. You will have title (ownership) to the Goods once you have fully paid for them (cash or cleared funds) and any other sums outstanding between you and us whether in respect of this Contract or otherwise. 11.3.3.	not affix the Goods to any land or building in such a way that they become incapable of removal without material injury to the land or building. 12.1.4.	terminate this or any other contract with you without liability on our part, provided that we shall complete orders on which you have made payment in full. 12.2. You will reimburse our costs including legal costs, which we incur in enforcing a breach of the Contract arising from your act or omission. 15.1. We may transfer our rights and obligations under a Contract to another organisation but this will not affect your rights or our obligations under these Terms. 15.2. You may only transfer your rights or obligations under these Terms to another person if we agree in writing. 15.3. We will try and solve any disagreements quickly and efficiently. If you are not happy with the way we deal with any disagreement and you want to take Court proceedings, then English law will apply and the courts of England and Wales will have exclusive jurisdiction in the case of any dispute. 15.4. Any waiver by us of any breach or default of these Terms does not mean that we will continue to waive that or any subsequent breach. 15.5. Each of the clauses of these Terms operates separately. If any court or relevant authority decides that any of them are unlawful or unenforceable, the remaining clauses will remain in full force and effect. 15.6. Any reference in these Terms to any Statute, Statutory Provision or Regulation includes a reference to that Statute, Statutory Provision or Regulation as amended extended or re-enacted at the relevant time. 15.7. The headings of these Terms are for convenience only and shall not affect their interpretation. 15.8. Termination of the Contract shall not affect the rights and obligations that have already accrued at the time of termination. 15.9. Nothing in these Terms or the Contract is intended to or will create any benefit for or right to enforce any of the Terms of the Contract to any third party. You are also informed of the existence of Online Dispute Resolution Platform (ODR Platform) or you can contact us info@ctdtiles.co.uk. “We”, “Us” and “Our” means Saint-Gobain Building Distribution Limited Registered in England & Wales No.1647362, trading as Ceramic Tile Distributors. 2.1	All orders are accepted by Us only under these Terms and they may not be altered – other than with the written agreement of a Company Signatory. Any contrary or additional terms, unless so agreed, are excluded. 2.2	Quotations are invitations to treat only. 2.3	Orders may be cancelled only with the agreement of a Company Signatory and You will indemnify Us against all costs, claims, losses or expenses incurred as a result of that cancellation. 2.4	You shall be responsible to Us for ensuring the accuracy of the terms of any order including any applicable design drawing or specification provided to Us by You and for giving Us any necessary information relating to the Goods within a sufficient time to enable Us to perform the Contract in accordance with its Terms. 2.5 2.5.1 It is your responsibility to be fully conversant with the nature and performance of the Goods, including any harmful or hazardous effects their use may have. 2.5.2	Without prejudice to Clause 2.5.4 of these Terms while We take every precaution in the preparation of our catalogues, technical circulars, price lists and other literature, these documents are for your general guidance only and statements included in these documents (in the absence of fraud on our part) shall not constitute representations by Us and We shall not be bound by them. 2.5.3	If You require advice (including Health and Safety information) in relation to the Goods, a specific request for advice should be made and any advice given in writing by a Company Signatory in response to such a request shall amount to a representation and We shall be liable accordingly. 2.5.5	For the avoidance of doubt, our liability for damages for misrepresentation (other than fraudulent) is excluded or limited by Clause 8 of these Terms. 3.1	The Price of the Goods shall be that prevailing at the date of delivery of the Goods. The price is exclusive of VAT which shall be due at the rate ruling on the date of a VAT invoice. 3.2	Prices listed or quoted are based on costs prevailing at the time when they are given or agreed. We shall be entitled to adjust the price of the Goods as at the time of delivery by such amount as may be necessary to cover any increase sustained by Us after the date of acceptance of your order and any direct or indirect costs of making, obtaining, handling, or supplying the Goods. 3.3	Prices quoted are applicable to the quantity specified and on the information provided by You at the time of order. In the event of orders being placed for lesser quantities, or if there is any change in specifications, delivery dates, or delay is caused by your instructions or lack of instructions, We shall be entitled to adjust the price of the Goods as ordered to take account of the variations. 3.4	We shall have the option of supplying any Goods ordered by You in imperial measurements in the nearest equivalent metric measurements and the Goods may be charged in metric measure allowing for conversions. 4.1	Unless the sale is for cash, or other credit terms have been agreed in writing with a Company Signatory, all accounts are due for payment on the last day of the month, following the month in which the Goods are invoiced. 4.2	We will accept payment of accounts by debit or credit card, cash, cheques, BACS subject to Money Laundering Regulations from time to time. 4.3	Late payment will incur interest at 8% above the Bank of England base rate, prevailing from time to time, until the date of payment after as well as before judgment. 4.4	Credit facilities may be withdrawn or reduced at any time at our sole discretion. 4.5	Even if We have previously agreed to give You credit, We reserve the right to refuse to execute any order or Contract if the arrangements for payment or your credit rating is not satisfactory to Us. In our discretion We may require security satisfactory to Us or payment for each consignment when it is available and before it is despatched in which case delivery will not be effected until We are in receipt of security or cleared funds as requested by Us. 4.6	In the case of short delivery, You will remain liable to pay the full invoice price of all Goods delivered or available for delivery. 4.7	You may not withhold payment of any invoice or other amount due to Us by reason of any right of set off or counterclaim, which You may have, or allege to have, for any reason whatsoever. 4.8	We shall be entitled at all times to set off any debt or claim of whatever nature which We may have against You against any sums due from Us to You. 5.1	Delivery will be effected when the Goods leave our premises whether carried by Us or an independent carrier, or the premises of our suppliers when the Goods are delivered direct from suppliers. 5.2	Delivery dates are given in good faith, but are estimates only. 5.3	Time for delivery shall not be of the essence of the Contract. 5.4	For the avoidance of doubt, and without detracting from any other provisions of these Terms, We shall not be liable for any damages whatsoever whether direct or indirect (including for the avoidance of doubt of any liability to any third party) resulting from any delay in delivery of the Goods, or failure to deliver the Goods in a reasonable time – whether such delay or failure is caused by our negligence or otherwise howsoever. 5.5	We reserve the right to make delivery by instalments and tender a separate invoice in respect of each instalment. Our failure to deliver any one or more instalments, or any claim by You in respect of any one or more instalments, shall not entitle You to treat the Contract as a whole as repudiated. 5.6	The price agreed includes our normal delivery charges but We may make an additional charge if We incur further costs or expense such as (but not limited to): i) those caused by delivery of less than a full load, ii) complying with your request for delivery outside our normal delivery pattern or trading by instalments, iii) orders of small value which are not economical for Us to deliver free. 5.7	You must provide the necessary labour for unloading the Goods – and unloading is to be completed with reasonable speed. If our delivery vehicle is kept waiting for an unreasonable time, or is obliged to return without completing delivery, or if We provide additional staff to unload Goods, an additional charge will be made. 5.8	You may collect Goods from Us during our trading hours. If they are not collected within 14 days from when We notify You that they are available, a storage charge will be payable before Goods are released. 5.9	If You fail to take delivery, accept or collect the Goods within the agreed time, in our discretion, We may make an additional charge, invoice You for the Goods, or treat the Contract as repudiated and, in any case, recover our losses from You. 5.10	If You collect Goods from Us, You are solely responsible for the size, weight and positioning of the load on the vehicle and shall indemnify Us in respect of all costs, claims, losses or expenses We may incur as a result of your collecting the Goods. 5.11	If the Goods are to be deposited other than on your private premises, You shall be responsible for compliance with all regulations, and for all steps which need to be taken for the protection at all times of persons or property. 5.12	We shall make a charge for packaging, including crate cases and pallets, which shall be credited if the crate cases or pallets are returned – carriage paid – in good condition and within seven days of delivery. Polythene sacks are not returnable. 5.13	You will indemnify Us in respect of all costs, claims, losses or expenses We may incur as a result of delivery in accordance with your instructions. This indemnity will be reduced in proportion to the extent that such costs, losses, claims or expenses are due to our negligence. 6.1	You shall inspect the Goods at the place and time of unloading or collection, but nothing in these Terms shall require You to break packaging and/or unpack Goods which are intended to be stored before use. 6.2.1	You must advise Us by telephone immediately and give Us written notice within three working days of unloading of any claim for short delivery. 6.2.2	If You do not give Us that notice within that time, the Goods will be deemed to have been delivered in the quantities shown in the delivery documents. 6.2.3	You shall not be entitled, and irrevocably and unconditionally waive any rights, to reject the Goods or claim any damages whatsoever, for short delivery howsoever caused. 6.2.4	Our liability for short delivery is limited to making good the shortage. 6.3.1	Where it is, or would have been, apparent on a reasonable inspection that the Goods are not in conformity with the Contract or (where the Contract is a contract for sale by sample) that the bulk does not compare with the sample, You must advise Us by telephone immediately, and give Us written notice within three working days of inspection. 6.3.2	If You fail to give Us that notice within that time, the Goods will be deemed to have been accepted and You shall not be entitled, and irrevocably and unconditionally waive any rights, to reject the Goods. 6.3.3	If You fail to give Us that notice within that time, Clause 8 shall have effect. 7.1	Risk in the Goods shall pass to You when the Goods are delivered. 7.2	The property in the Goods shall remain with Us until You pay all sums due to Us, whether in respect of this Contract or otherwise. 7.3.1	You shall hold the Goods as our fiduciary agent and bailee. 7.3.2	The Goods shall be stored separately from any other goods and You shall not interfere with any identification marks, labels, batch numbers or serial numbers on the Goods. 7.3.3	We agree that You may use, or agree to sell the Goods as principal and not as agents in the ordinary course of your business subject to the express condition that at our direction, the entire proceeds of any sale or insurance proceeds received in respect of the Goods are held in trust for Us and not mixed with any other monies, or paid into an overdrawn bank account and, it shall, at all times, be identifiable as our money. 8.1	Nothing in these Terms shall exclude or restrict our liability for death or personal injury resulting from our personal negligence or our liability for fraudulent misrepresentation. 8.2	Subject to Clause 8.1 of these Terms, We shall not be liable by reason of any misrepresentation (unless fraudulent) or any breach of warranty condition or other term express or implied or any breach of duty (common law or statutory) or negligence for any damages whatsoever. Instead of liability in damages, We undertake liability under Clause 8.3 below. 8.3	Where but for the effect of Clause 8.2 of these Terms You would have been entitled to damages against Us, We shall not be liable to pay damages but subject to the conditions set out in Clause 8.4 below shall at our sole discretion, either repair the Goods at our own expense, or supply replacement Goods free of charge or refund all (or where appropriate part) of the price of the relevant Goods. 8.4.1	if the Defect arises from wear and tear. 8.4.2	if the Defect arises from wilful damage, negligence, abnormal working conditions, misuse, alteration or repair of the Goods, failure to follow British Standard or industry instructions relevant to the Goods, or storage of the Goods in unsuitable conditions (but this sub-clause shall not apply to any act or omission on our part). 8.4.3	unless after discovery of the Defect We are given a reasonable opportunity to inspect the Goods before they are used, or in any way interfered with. For the avoidance of doubt, We acknowledge that the costs of suspending works are relevant to the determination of what is reasonable opportunity and this sub-clause shall not apply to any works affecting the Goods, which it may be reasonably necessary to carry out in the interests of safety and/or as emergency measures. 8.4.4	if the Defect would have been apparent on a reasonable inspection under Clause 6.1 of these Terms at the time of unloading, unless You advise Us by telephone immediately and written notice of any claim is given to Us within three working days of the time of unloading. 8.4.5	if the Defect is discovered within four months from the date of delivery, unless You give Us written notice of the Defect within three working days of it being discovered. 8.4.6	if in any case the Defect is discovered more than 4 months from the date of delivery. 8.5	If the Goods are not manufactured by Us, or have been processed or milled by a third party – whether or not at your request – our liability, in respect of any Defect in workmanship or materials of the Goods, will be limited to such rights against the manufacturer or the third party as We may have in respect of those Goods. 8.6.1.5	a claim maintainable against Us pursuant to Clause 8.1 of these Terms. 8.6.2	You will unconditionally, fully and effectively indemnify Us against all loss damages, costs on an indemnity basis and expenses awarded against, or incurred, by Us in connection with, or paid, or agreed to be paid, by Us in settlement of any claim for infringement of any patents, copyright design, trademark, or any other industrial or intellectual property rights of any other person. 8.6.3	You will further unconditionally, fully and effectively indemnify Us against all loss damages, costs on an indemnity basis and expenses awarded against, or incurred by Us in connection with, or paid, or agreed to be paid, by Us in settlement of any other claim arising from any such manufacturing processing or milling, including – but not limited to – any Defect in the Goods. This indemnity will be reduced in proportion to the extent that such loss damage, costs and expenses are due to our negligence. 8.7	You will unconditionally, fully and effectively, indemnify Us against all loss damages, costs on an indemnity basis and expenses awarded against, or incurred by Us in connection with, or paid, or agreed to be paid by Us in settlement of any claim by any third party arising from the supply or use of the Goods. This indemnity will be reduced in proportion to the extent that such loss, damage, costs and expenses are due to our negligence. 8.8	You (not being a Consumer) agree that where the Goods (being electrical equipment) become a waste in accordance with Directive 2002/96/EC (including any amendments and re-enactments thereof) and all applicable Member State implementing regulations and laws (together known as the “WEEE Directive”), You agree to bear the responsibility for ensuring, and financing all costs of collection, treatment, recovery and environmentally sound disposal of the Goods in accordance with the WEEE Directive. In addition You (not being a Consumer) also agree to bear responsibility for compliance with such requirements and financing all such costs in respect of any Goods (being electrical equipment) which are being replaced by Goods as a new equivalent product or as a new product fulfilling the same function. Additionally You agree to indemnify and hold harmless Us and any other person who is the producer of the Goods within the meaning of the WEEE Directive from all such costs referred to in this clause. 8.9	Without prejudice to any other provisions in these Terms, in any event, our total liability for any one claim, or for the total of all claims arising from any one act of default on our part howsoever arising (whether arising from our negligence or otherwise), shall not exceed the purchase price of the Goods – the subject matter of any claim. 9.1	For the purposes of this clause, (a) "Data Protection Laws" means any laws and regulations relating to the use or processing of personal data including: (i) the Data Protection Act 1998 ("DPA"), the Privacy and Electronic Communications (EC Directive) Regulations 2003 and any other applicable legislation implementing or made pursuant to EU Directives 95/46/EC and 2002/58/EC (as amended by 2009/136/EC), and (ii) from 25 May 2018, EU Regulation 2016/679 ("GDPR"), and (iii) any laws or regulations ratifying, implementing, adopting, supplementing or replacing the GDPR; in each case, as updated, amended or replaced from time to time; and (b) the terms "Data Subject", "Personal Data", "processing", "processor" and "controller" shall have the meanings set out in the GDPR. 9.3	To the extent that a party processes any Personal Data on behalf of the other party, the processing party shall: (a) comply with the provisions and obligations imposed on a processor by the GDPR, including the stipulations set out in Article 28(3)(a)-(h) which form a part of, and are incorporated into, these Terms as if they were set out in full, and the reference to "documented instructions" in Article 28(3)(a) shall include the provisions of these Terms; and (b) not disclose any Personal Data to any Data Subject or to a third party other than at the written request of the other party or as expressly provided for in these Terms. 9.4	You agree that we may engage third party providers including any advisers, contractors, or auditors to Process Personal Data ("Sub-Processors"). We shall ensure that our contract with each Sub-Processor shall impose obligations in relation to the Processing of Personal Data on the Sub-Processor that are materially equivalent to the obligations to which we are subject to under these Terms in relation to the Processing of Personal Data. 9.5	If either party receives any complaint, notice or communication which relates to the processing of Personal Data by the other party or to either party's compliance with the Data Protection Laws, or if any Personal Data processed in connection with these Terms is subject to a personal data breach (as defined in the GDPR), it shall immediately notify the other party and provide the other party with reasonable co-operation and assistance in relation to any such complaint, notice, communication or personal data breach. 10.1	“Insolvent” means You becoming unable to pay your debts within the meaning of Section 123 of the Insolvency Act 1986; the levying or the threat of execution or distress on any of your property; the appointment of a receiver or administrative receiver over all, or any part, of your property; a proposal for a voluntary arrangement or compromise between You and your creditors, whether pursuant to the Insolvency Act 1986 or otherwise; the passing of a resolution for voluntary winding-up, or summoning a meeting to pass such a resolution otherwise than for the purposes of a bona fide amalgamation or reconstruction, the presentation of a petition for your winding-up, or for an administration order in relation to You. If You suffer any analogous step or proceedings under foreign law or You are ceasing, or threatening to cease to carry on your business. 10.2.3	without prejudice to the generality of Clause 7 of these Terms exercise any of our rights pursuant to that clause. 10.3	If We reasonably incur third party costs, such as tracing or debt collection agency costs, or seek to take legal proceedings to enforce our rights as a result of your breach of this Contract – including but not limited to – recovery of any sums due, You will reimburse Us such reasonable agency costs or legal costs incurred on an indemnity basis. 10.4	Without prejudice to clause 10.3 if You are acting in the course of a business then in the event of late payment We reserve the right to claim compensation pursuant to the Late Payment of Commercial Debts (Interest) Act 1998 at the prevailing rate, currently £40 for a debt less than £1000, £70 for a debt of more than £1000 but less than £10,000 and £100 for a debt in excess of £10,000. 11.1	Without affecting any other right or remedy available to us, we may terminate any Contract with you with immediate effect by giving written notice to you if you commit a material breach of any term of the Contract which breach is irremediable or (if such breach is remediable) fails to remedy that breach within a period of seven (7) days after being notified in writing to do so. 11.2	This Contract shall be governed and interpreted according to the Law of England and Wales and You agree to submit to the non-exclusive jurisdiction of the English Courts. 11.3	We shall not be liable for any delay or failure to perform any of our obligations in relation to the Goods due to any cause beyond our reasonable control, including industrial action. 11.4	The waiver by Us of any breach or default of these Terms shall not be construed as a continued waiver of that breach, nor as a waiver of any subsequent breach of the same, or any other provision. 11.5	If any clause or sub-clause of these Terms is held by a competent authority to be invalid or unenforceable, the validity of the other clauses and sub clauses of these Terms shall not be affected and they shall remain in full force and effect. 11.6	We may assign novate, or subcontract all or part of this Contract and You shall be deemed to consent to any novation. This Contract is personal to You and it may not be assigned by You. 11.7	Nothing in this Contract is intended to, or will grant any right, to any third party to enforce any Terms of this Contract, be it express or implied. 11.8	Incorporation of your business: Until You are informed in writing by Us that either the status of the account has been amended to a limited company or a fresh account opened all orders will continue to be debited to the current account and You will remain responsible to Us. 12.1	You shall ensure that in any dealings with the Us, neither You nor your employees or agents shall commit any offence under the Bribery Act 2010 (“the Act”) including not engaging in any activity, practice or conduct which would constitute an offence under sections 1, 2 or 6 of the Act. You shall inform Us immediately You become aware of any actions between the parties that could constitute an offence under the Act. 12.2	It is our and our group’s policy to comply with all applicable sanctions and legal requirements for the import and export of goods, technology and services. We are committed to ensuring compliance with all regulatory and licensing requirements relating to international trade. We do not permit the supply of any of our goods to any individuals, companies or organisations that are subject to any trade, economic or financial sanctions, embargoes or similar restrictive measures administered, enacted or enforced by the UK, EU, UN or USA (“Sanctioned Entities”). By entering into this Contract you agree not to re-sell or otherwise transfer the Goods, either directly or indirectly, to any Sanctioned Entities. 13.1	You shall be responsible for complying with any legislation or regulations governing the importation of the Goods into the country of destination and for the payment of any duties on them. 13.2	You shall be liable for and shall indemnify and hold us harmless from any and all liability, loss, claims, damages.